99.99% accurate carton validation solution for conveyor belts. This cage will set you free…free from EPC chargebacks, shipping inaccuracies, and inefficient, random carton audits. The CYBRA RFID Cage validates EPC-tagged items in cartons at greater than 99% read accuracy, at conveyor speeds of up to 600 feet per minute. Use the CYBRA RFID Cage to convert EPC compliance costs into real cost savings. The CYBRA RFID Cage validates EPC-tagged items in cartons at greater than 99% read accuracy, at conveyor speeds of up to 600 feet per minute. Read every single item in every single carton received, and validate every single item in every single outbound carton packed. Nothing gets past the Cage. If you’re shipping and receiving large sums of packages each day, you know it’s all about throughput. The CYBRA RFID Cage is a pre-configured solution consisting of an RFID reader, antennas and sensors ready to easily mount over an inbound or outbound conveyor. This solution enables auditing of every item in every single carton received, and can validate every single item in every single outbound carton packed. The CYBRA RFID Cage easily integrates with existing legacy ERP and WMS systems. 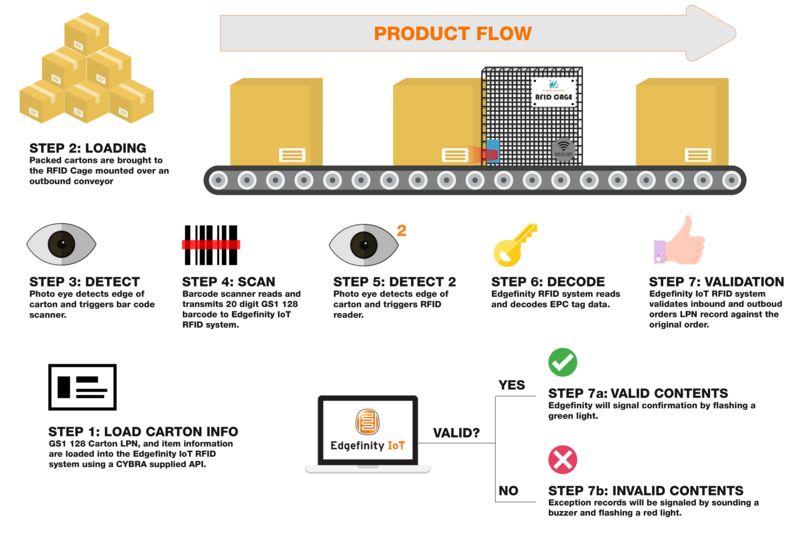 Using the RFID Cage, Edgefinity scans the UCC128 or LPN barcode, reads EPC tags in carton, converts EPC data to UPC, then validates UPC detail against PO detail. The CYBRA RFID Cage can operate stand alone, validating random sample cartons, or picked up and placed over powered conveyor, to validate every carton. The CYBRA RFID Cage brings a host of features and capabilities that you simply will not find anywhere else. Why randomly check your shipping and receiving manually? You can efficiently automate your validation processes, and drastically improve accuracy, with zero down time! You don’t want to pay chargeback fines. Especially when you are sure that what your shipped out was correct. Minimize these potential risks by recording every outbound carton’s contents. The CYBRA RFID Cage and EdgeMagic gives you the tools and data to fight chargebacks. Next time they send you the chargeback, show them exactly what was sent out and when carton by carton. We understand validation isn’t always simple. Different products perform differently. Metal zippers can interfere with RFID reading, slowing down your entire workflow. Adjusting thresholds is the key. 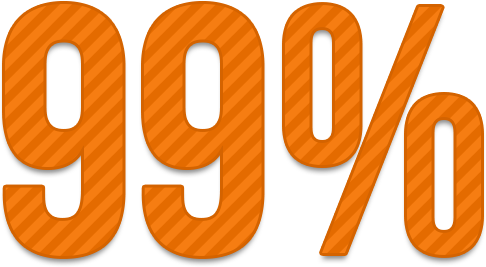 If you need one product to validate at 100% and others at 75%, you can. This is yet another simple way to maximize your shipping and receiving, while minimizing mistakes. A natural benefit from the CYBRA RFID Cage solution is included tag vendor score card. You can quickly see if there are wide ranges in tag performance or if there is consistency in readability. For the first time you can achieve visibility to what is actually entering the supply chain. And it’s an exclusive benefit only available with the CYBRA RFID Cage solution. The CYBRA RFID Cage can be installed while your warehouse team is out to lunch. Really! The RFID Cage can be installed on most shipping or receiving lines in a matter of minutes. And, once installed, the CYBRA RFID Cage requires little maintenance. It can’t get any easier than that. No other product in the world can offer such a quick set up. Start validating your receipts and shipments today. The CYBRA RFID Cage can read and verify thousands of items per hour with greater than 99% accuracy. No matter how fast your lines move, 150 feet per minute, 350 feet per minute, even 600 feet per minute, the CYBRA RFID Cage can read and verify carton contents. There is nothing else on the market that can validate cartons that quickly and accurately. That’s not too fast for you, is it? To perform with incredible high speed and throughput the CYBRA RFID Cage solution features our exclusive EdgeMagic validation algorithms that allow the closest carton separation at the highest possible line speed. The CYBRA RFID Cage can keep up with your most demanding workflow and accurately differentiate the contents of each swift moving box. Verify tag tracking quality with our exclusive tag vendor score card. 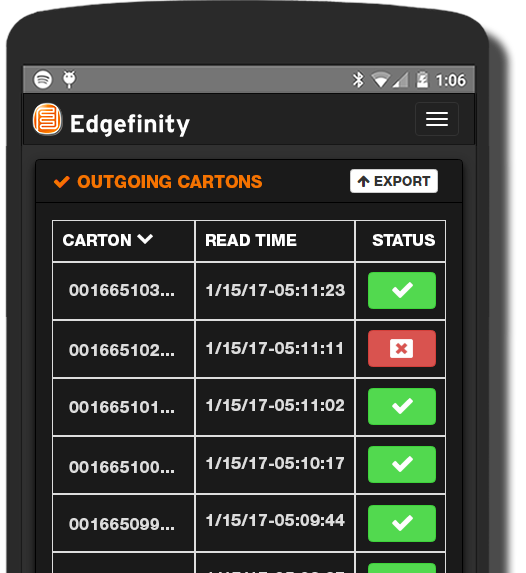 Built right into Edgefinity IoT. As shown in the screenshot, you can compare the RSSI of each tag. You can quickly see if there are wide ranges in tag performance or if there is inconsistency in readability. INTERESTED IN THE CYBRA RFID CAGE? The RFID Cage is a rare product that validates cartons faster, and more accurately than anything on the market right now. Support your retail partner’s omnichannel initiatives easily with CYBRA’s RFID solutions. Contact CYBRA today to see how the RFID Cage can significantly impact your supply chain initiatives. Contact CYBRA today to see how the RFID Cage can significantly impact your supply chain initiatives.